HP starts battle with NeatDesk and Neat Works. Neat Co. ready for the challenge? 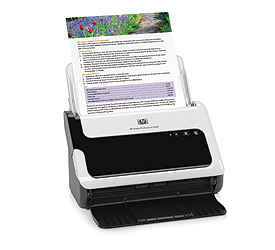 The hardware side of the package is typical for this class of document scanner. Physically similar to the NeatDesk ($399.95, 3.5 stars) that I reviewed earlier this year, it measures 6.4 by 11.1 by 6 inches (HWD) with the input and output trays closed. Opening the trays to scan adds about 8 inches to the front and 4 inches to the height. The automatic document feeder (ADF) offers a substantial 50-sheet capacity and can handle paper up to 8.5 inches wide by 34 inches long. Optical resolution is 600 pixels per inch (ppi), which is more than enough for document scanning. Another player enters the digital filing battle as HP sets it sights on NeatDesk from the Neat Company.